The book that grew out of the manuscript in question. 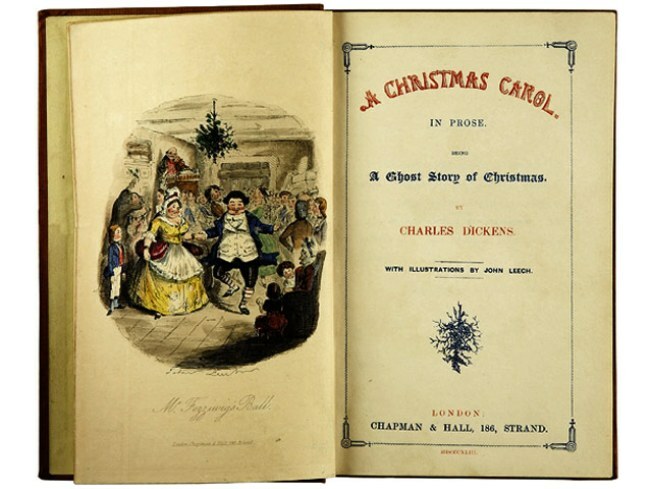 Note to those with procrastination issues or writer’s block: Charles Dickens wrote “A Christmas Carol” in six weeks in the fall of 1843 to make the deadline for the holiday retail season. And he didn’t have a shiny MacBook to make his life easier, either. When the original manuscript was returned to him by the publisher, Dickens had it bound in red Moroccan leather as a gift for his solicitor. It then changed hands a few times until it was acquired by Pierpont Morgan in the 1890s, and it’s now on display at the Morgan’s Library in the museum's McKim Building, through January 10. What’s immediately apparent is how Dickens worked: He banged the thing out, revising as he wrote, refining with more active verbs and tightening up his prose. All with a quill. Makes us feel like slackers.